This VisitWales 4* farmhouse was restored in 2009 and is in an idyllic setting adjacent to a working livestock farm, four miles from the market town of Llandovery and a short walk to the Crychan Forest. The entrance to the property has double gates to ample parking at the front and side and a large enclosed garden. 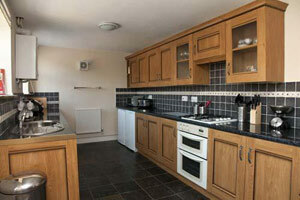 There is a patio at the rear with garden furniture and a barbecue (April to October). 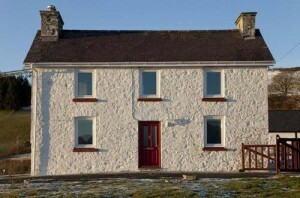 The property sleeps 8 adults or 7 adults and 2 children and has five bedrooms, three bathrooms and central heating. Downstairs, there is a well equipped new kitchen with an electric oven, microwave, slow cooker, steamer, dishwasher, fridge, freezer, washing machine. 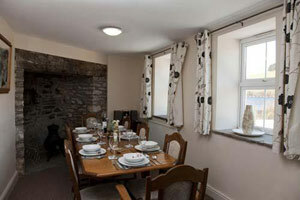 The dining area has comfortable seating for nine people around the long dining table, and a hifi with DAB radio. There is a candlelit semi-circular stone fireplace with bread oven and chimenea. 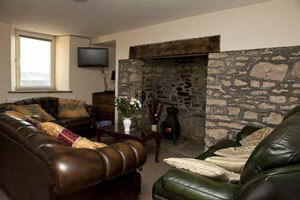 The sitting room is warm and comfortable with green and brown leather sofas, and a stone fireplace with an attractive array of candles in a cast iron chimenea. The flat screen tv has Freeview, DVD and Playstation 2. There is a also a door to the downstairs shower room and wc. 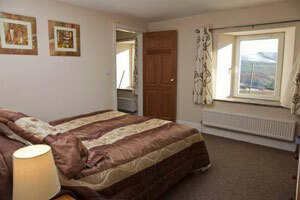 The downstairs double bedroom also has access to the shower-room but can be securely locked off when necessary. It is suitable for visitors with walking difficulties. Upstairs to a galleried landing, off which there are four bedrooms and two bathrooms.